Kofi Ofosu ’19 grew up in Kwahu Bepong, Ghana, approximately 80 miles from where Kofi Annan ’61 was born in Kumasi. The two shared a name, in an Akan language tradition for boys born on a Friday. And of course Ofosu knew about Annan. Everyone in Ghana knew about the renowned leader who represented the country in global diplomacy, serving as the seventh Secretary-General of the United Nations from 1997 to 2006 and receiving the Nobel Peace Prize in 2001 in honor of his work to revitalize the UN and prioritize human rights. 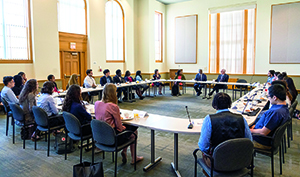 In May, Kofi Annan met with two dozen student leaders on campus. Ofosu got that chance in May, more than 6,000 miles away from Ghana. On a bright Monday morning after final exams had concluded, the chemistry major and Davis United World College Scholar joined two dozen other Macalester student leaders for breakfast with Annan, who had returned to his alma mater for the dedication of the Kofi Annan Institute for Global Citizenship, renamed in his honor. Representing the Afrika! student organization, Ofosu went into the Weyerhaeuser boardroom expecting to find a statesman who was imposing, brash, and outspoken—traits he’d come to expect from successful politicians and global leaders. Instead, what stood out immediately was what Ofosu described as quiet charisma. 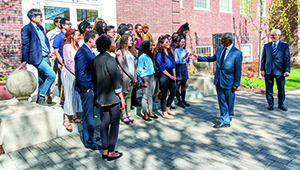 Before fielding questions about decisions and challenges he faced during his career, Annan told the students about his own Macalester experience during his two years on campus through a Ford Foundation program that placed foreign nationals in U.S. colleges and universities. He talked about how his worldview broadened at Mac, a message that resonated with the current students, Ofosu says. An economics major, Annan was a state-champion orator who also played soccer, loved Ping-Pong, and set a school record in the 60-yard dash. He also explored the United States with classmates through Macalester’s Ambassadors for Friendship program, which sent out groups of students in Nash Rambler station wagons in the ’60s and ’70s. Later that day, Annan and President Brian Rosenberg sat down in front of a much larger audience in the fieldhouse for a conversation that examined leadership, current global challenges, and youth engagement. The campus event closed with Rosenberg leading more than 3,000 audience members in singing “Happy Birthday” to Annan, who had turned 80 in April. “That’s the first time I’ve had that many people sing ‘Happy Birthday’ to me,” Annan told the crowd, laughing. Less than four months later, the Macalester community in St. Paul woke up on Saturday, August 18, to learn that Annan had died at a hospital in Bern, Switzerland, after an unexpected brief illness. That morning, Rosenberg sent a message to the Macalester community. “You can read elsewhere about the extraordinary public accomplishments of this man from Ghana who moved from our campus onto the world stage, where he became a forceful advocate for peace and human rights around the globe,” he wrote. “He was for many years, and will forever remain, the ultimate embodiment of Macalester’s mission. 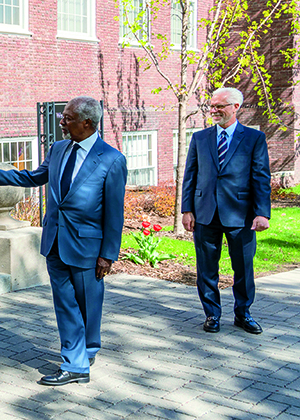 KOFI ANNAN remained connected to his Macalester roots, returning to campus several times as well as serving as a trustee and trustee emeritus and a member of the Institute for Global Citizenship’s global advisory board. The following reflections are from his remarks during those visits. When Annan talked with Mac students, he encouraged them to take on leadership roles. “I firmly believe that you are never too young to lead,” he said on campus in May. “As part of its curriculum, Mac has always motivated its students to go out and work in the world beyond these campus walls. Build on the courage which that has instilled in you. Act on your innocence; explore new frontiers where older, wiser, more cautious people might not. Failure is part of success; if you don’t fail now and then, it probably means you are not pushing hard enough. After graduation, Kofi Annan studied at the Graduate Institute of International and Development Studies in Geneva, Switzerland, then joined the United Nations system the following year as a budget officer with the World Health Organization. In 1997, he was elected the UN’s seventh Secretary General, a position he used to strengthen peacekeeping initiatives, combat HIV, and launch the UN Global Compact, the world’s largest effort to promote corporate social responsibility. In 2001, the Nobel Committee awarded the Peace Prize to Annan and the United Nations for revitalizing the UN and prioritizing human rights. After concluding his tenure as Secretary-General in 2006, he continued his advocacy by serving as chair of organizations including the Alliance for a Green Revolution in Africa, the African Progress Panel, and The Elders, an independent group of global leaders who work together for peace and human rights. At the time of his death, he was the chair of the Kofi Annan Foundation, which he founded in 2007 to mobilize leaders from all sectors to overcome threats to peace, development, and human rights. 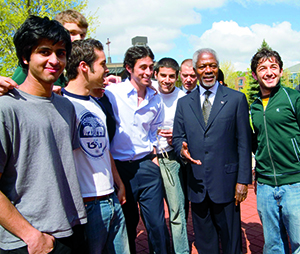 When Annan visited Mac in April 2006 to help inaugurate the new Institute for Global Citizenship, he took an impromptu stroll around campus, meeting students along the way. Following his death, Mac alumni shared thoughts in August via social media on Kofi Annan’s legacy.